A new record for the weight of goods brought and taken – half a tonne – was set at the final Recycle Swap Shop of 2014. A huge variety of items were available at the Tilling Green Centre last Saturday [November 22], from camp chairs and floor tiles to DIY books and curtains, plus piles of toys, books, clothes and kitchen goods. Remember – you don’t have to bring stuff to the recycle swap shop – we need people to come and take stuff away as well! 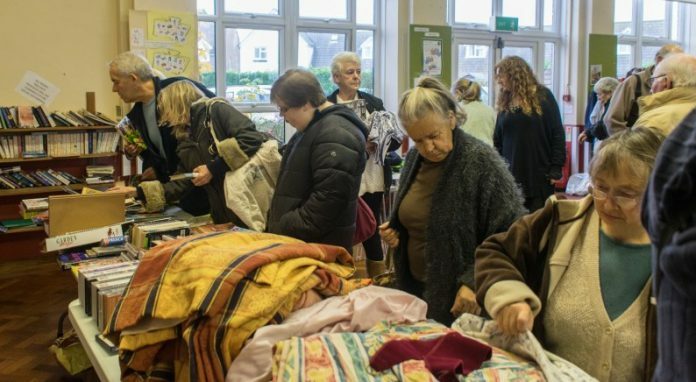 About 550kg of goods were brought to the hall, with 70% taken away by visitors, 20% going to charity shops, 5% being recycled and 5% ending up in landfill. The total weight of goods brought to recycle swaps since they started in 2012 is now over five tonnes! Not only have people saved money, taking away items for free (though many make a small voluntary donation to the cost of running the event, which is usually about £60), but the environment has also benefited, by making better use of resources and reducing landfill. As an added bonus this time, RX Energy Rye, a community-run organisation, was on hand to give advice to visitors on how to reduce their energy bills, by saving energy and finding better tariffs. They will be at the next Recycle Swap Shop as well, so bring some old energy bills along if you would like them analysed for free by trained volunteers with no hidden agenda! Don’t forget the next event is Saturday March 21, 2015, at the Tilling Green Centre, Mason Road, Rye TN31 7BE, again. More details will be at www.transitionrye.org.uk nearer the time.